On March 19, 2019, Ambassador He Xiangdong bids farewell to H.E. Gen. Salva Kiir Mayardit, President of the Republic of South Sudan. Also present at the meeting are Hon. Mayiik Ayii Deng, Minister in the Office of the President, and Hon. Baak Valentino Wol, Undersecretary of the Ministry of Foreign Affairs and International Cooperation of South Sudan. 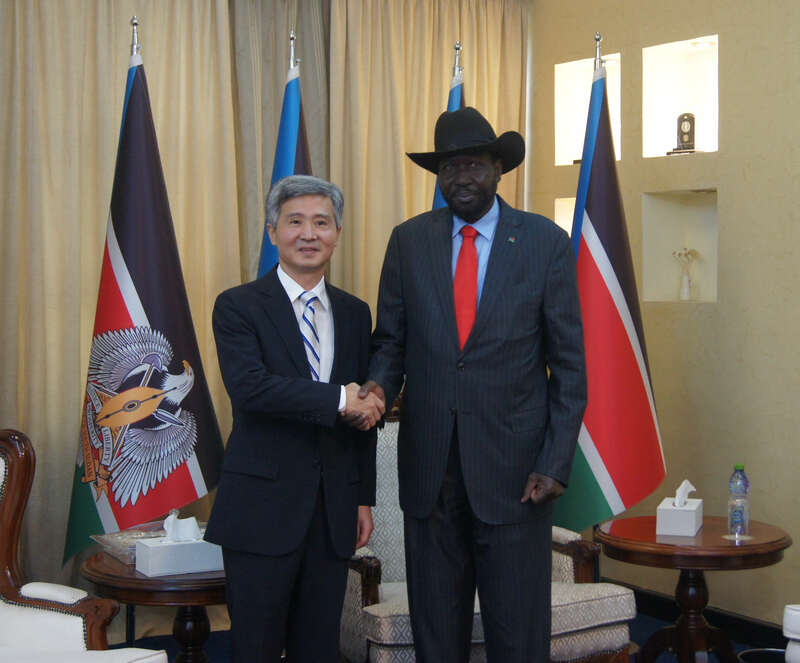 Ambassador He expressed his heartfelt appreciation to President Salva Kiir and the South Sudanese Government for the firm support granted to him during his tenure. Ambassador He said that China will work closely with South Sudan to implement the outcomes of FOCAC Beijing Summit and consensus reached by the heads of states last year, further deepening cooperation in various fields and strengthening bilateral relations.China will continue to provide support and assistance to the peace process and nation building of South Sudan and hopes that peace and stability will be restored in the country at an early date. President Kiir asked the Ambassador to convey his sincere greetings and best wishes to President Xi Jinping. President Kiir spoke highly of Ambassador He’s contribution to the development of South Sudan-China friendly relationship. President Kiir stressed that South Sudan pays great importance to developing South Sudan-China relations. Deepening bilateral relations with China is one of the common consensus of the South Sudanese government and people. South Sudan is willing to strengthen coordination and cooperation with China in various fields to further promote bilateral relations to new levels.